Sometimes the weekend sneaks up on you and after a long week a really simple, really good dinner at home can top any dinner out, but shouldn’t make you feel any less fabulous! Grab a bottle of wine and eat this salad any day of the week! I personally, found truffle burrata cheese, but if you can’t find that you can grab some truffle oil at most supermarkets or specialty stores and marinade burrata in it for a while you prepare dinner. Set up a traditional breading station, flour, then egg, then breadcrumb mixture. Combine all the breadcrumbs with the parmesan cheese and set aside. Heat olive oil in a large skillet. Dredge each chicken cutlet in the flour, shake off the excess and place in the egg mixture and then the breadcrumb mixture and set aside for 5 minutes. I like to do this because I feel the crumb mixture stays in place better than going from the breading to the oil immediately. Carefully place the cutlets into the pan AWAY from you and cook until golden brown on each side. Approximately 5 minutes each side. 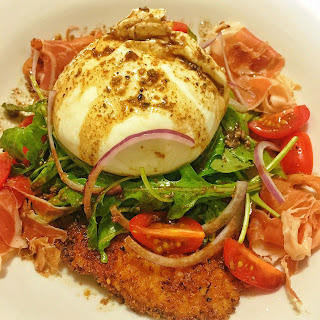 To assemble: Put the crispy cutlet on a plate and top with burrata, if you can’t find burrata fresh mozzarella balls are an excellent substitute. Add the arugula or spring mix, sliced onions and tomatoes. I like to simply dress this salad with a drizzle of really good olive oil and really good balsamic vinegar with fresh cracked pepper and good sea salt. If you cannot get truffle burrata or mozzarella you can drizzle LIGHTLY the salad with truffle oil, a little goes a LONG way and can quickly over power this whole dish. Add some thin sliced prosciutto Di Parma and mangia!